The official narrative of the First World War has been well documented by historians. Nevertheless, the battle for hearts and minds still rages. In recent years Gerry Docherty and Jim MacGregor joined the battle for hearts and minds. Hidden History uniquely exposes those responsible for World War I. It reveals how accounts of the war’s origins have been deliberately falsified to conceal the guilt of the secret cabal of very rich and powerful men in London responsible for the most heinous crime perpetrated on humanity. For 10 years, they plotted the destruction of Germany as the first stage of their plan to take control of the world. The assassination of Archduke Franz Ferdinand was no chance happening. It lit a fuse that had been carefully set through a chain of command stretching from Sarajevo through Belgrade and St. Petersburg to that cabal in London. Our understanding of these events has been firmly trapped in a web of falsehood and duplicity carefully constructed by the victors at Versailles in 1919 and maintained by compliant historians ever since. The official version is fatally flawed, warped by the volume of evidence they destroyed or concealed from public view. Hidden History poses a tantalizing challenge. The authors ask only that you examine the evidence they lay before you. The fact that governments lie is generally accepted today, but World War I was the first global conflict in which millions of young men were sacrificed for hidden causes. They did not die to save civilization; they were killed for profit and in the hopes of establishing a one-world government. By 1917, America had been thrust into the war by a President who promised to stay out of the conflict. But the real power behind the war consisted of the bankers, the financiers, and the politicians, referred to, in this book, as The Secret Elite. Scouring government papers on both sides of the Atlantic, memoirs that avoided the censor’s pen, speeches made in Congress and Parliament, major newspapers of the time, and other sources, Prolonging the Agony maintains that the war was deliberately and unnecessarily prolonged and that the gross lies ingrained in modern “histories” still circulate because governments refuse citizens the truth. Featured in this book are shocking accounts of the alleged Belgian “outrages,” the sinking of the Lusitania, the manipulation of votes for Herbert Hoover, Lord Kitchener’s death, and American and British zionists in cahoots with Rothschild’s manipulated Balfour Declaration. 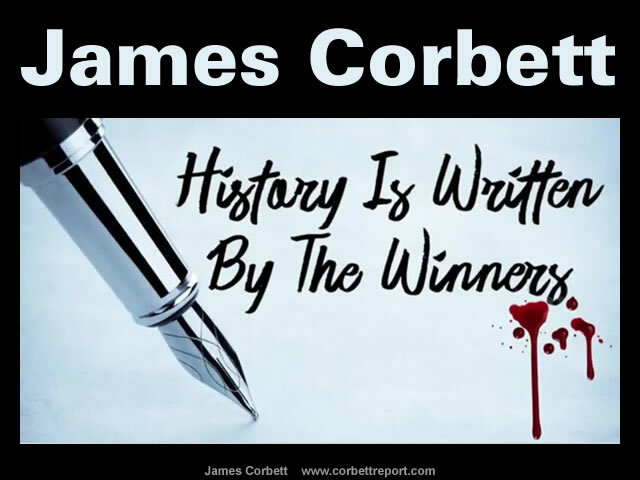 And in recent months James Corbett joined the battle for hearts and minds. What was World War One about? And what did they win? But as we shall see, this confusion is not a happenstance of history but the wool that has been pulled over our eyes to stop us from seeing what WWI really was. This is the story of WWI that you didn’t read in the history books. This is The WWI Conspiracy. Difficult as it had been for the Round Table to maneuver the British Empire into the war with Germany, it would be that much harder for their American fellow travelers to coax the United States out of its neutrality and into World War One. The cabal was going to have to leverage its control of the press and key governmental positions to begin to shape public perception and instill pro-war sentiment. And once again, the full resources of these motivated co-conspirators were brought to bear on the task. In the first two parts of this series we have seen how the WWI conspiracy came to be. But more important by far is the question of why it happened. For what purpose was such carnage released upon the world? What did the First World War mean? James Corbett also provides some very interesting insights into the writing of official narratives. Who gets to write the history textbooks? Where do the history teachers learn about history? What documents are allowed into the historical record, and what documents are excluded? These are not merely academic questions, they go right to the heart of the question of history itself. 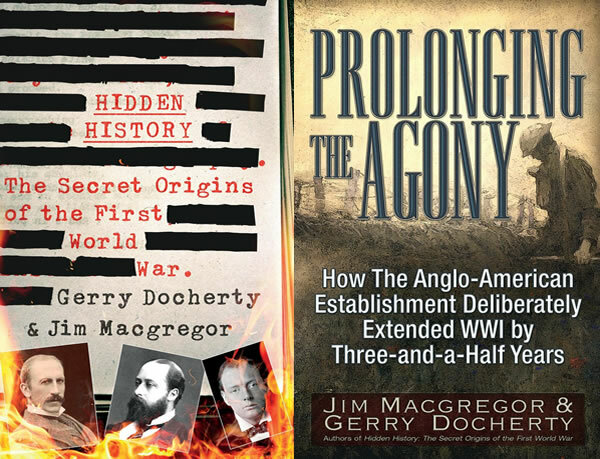 Gerry Docherty, co-author with Jim MacGregor of Hidden History: The Secret Origins of the First World War, joins us for an in-depth discussion about the real origins of WWI. In this wide-ranging discussion, Docherty reveals the machinations of the Secret Elite that ensnared Europe, and, ultimately, the world, in war. We also talk about the teaching of history and who controls the historical narrative on key global events. Further insights are also provided by Jim MacGregor and Gerry Docherty. One of the great myths of the First World War is that the United States was not directly involved until April 1917, at which point a coalition of circumstances demanded her formal involvement. The 1916 election proved to be very close indeed. What matters in an American Presidential election is the Electoral College vote of which, in 1912, there were 530, so the winner had to reach a minimum of 266. Did Professor Quigley decide in the end, like his fellow historian Professor Alfred Zimmern, that the secret society posed such a menace to the world that he chose to expose it? We shall never know. Unable to ridicule Tragedy and Hope as ‘conspiracy theory’ because of his exalted academic position and status, those he named decided to bury the book. Immediately on its release, unknown persons removed it from bookstore shelves in America – ‘faster than exploding Easter bunnies’ as one wit put it. It was withdrawn from sale without any justification and its original plates were destroyed by Quigley’s publisher, the Macmillan Company. as was the case one hundred years ago. Excellent summary from which additional rabbit holes can be searched f0r further insights. Carroll Quigley’s study TRAGEDY AND HOPE (Macmillan 1966) must be sharply distinguished from anti-Jewish conspiracy theories that selectively use him for their sinister intentions. The idea that a strategic economic operation à la Cecil Rhodes was in reality the brainchild of his bankers is as absurd that the invention of the light bulb is owed to the financiers of its mass production. The erroneous thesis that German alone was responsible for the First World War has indeed determined the debate for a long time. There is now, however, a wealth of literature for its untenability. Often ignored by the “Blame the Bankers” viewpoint is that in order to lend, bankers need borrowers, and problems arise when the borrowers miscalculate and become unable to pay back what they borrowed. Tzar Nicolas apparently had 9 loans from French Bankers to fund his imperial follies. The French Revolution had its origins in the spending habits of the Bourbons. And who initiates the transactions? The bankers or the non-producing politicians? The politicians and rulers seeking new resources to plunder. In order to live and hence survive,. one must produce, and those who don’t, plunder the producers. Kings, princes and dictators produce nothing and are none other than the leaders of brigands, bandits and robbers. But scarcity of resources ultimately is caused by over-population, and is the biological response to future catastrophes and mass culling so that some will always survive. And if we assume a non-warring economy where everything that is produced is consumed, so that ultimately no wealth accumulates, (the ideal rotating economy) what would kings and princes, or rulers, do when they need to embark on some or other folly? As the people have no money to plunder, the princes fund their follies and political promises by using Ponzi schemes, and forcing the bankers to facilitate it. And if we assume the proselytisers of religion and ideology, being economic non-producers, are left with only plundering as their means of staying alive, then stealing from other cultures and nations becomes the norm. But it is the ignorance of the ultimate cause of over population that is the problem, and that seems to have its origin in the Bronze Age catastrophes, the consequences of which humanity avoids by escaping into the virtual worlds of religion and ideology. I should add that the Bronze Age catastrophes would have resulted in the formation of bands or brigades of plundering survivors, and who subsequently became habituated to this mode of existence. Right on cue and Tom Woods, on the Lew Rockwell website, (https://www.lewrockwell.com/2018/12/thomas-woods/left-wing-rapper-just-gave-me-an-early-christmas-present/), writes that for some, here the left-wing rapper Taleb Kweli Greene, the Berlin Wall was constructed by the NAZIS, that was torn down during 1991, or, once his error was pointed out, then attributed the Berlin Wall as something the East Germans built to keep the West out. From these erroneous opinions and others, history becomes fabricated, and uncorrected official history if it unexpectedly also diverts attention from the real criminals. Rather than refute fabricated history, it’s easier to ignore it. Banking originated in China and India. Why shouldn’t they invest in railways and linking economies together? Better than blowing bubbles in housing? Anyway, the Fabian/Tmeplars are taking care of all that. The NWO is nearly here…..